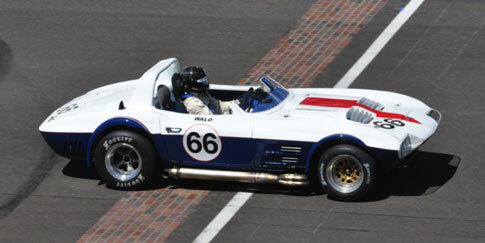 Duntov customer and SVRA CEO Tony Parella gave 750 vintage racers the time of their racing lives by hosting the first ever Brickyard Invitational at Indy. 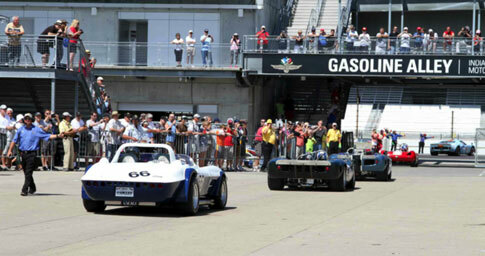 The event ran so smoothly, it was as if SVRA and the Speedway had been hosting it for years. The paddock was jammed with race trailers, large and small. All the Gasoline Alley garages and F1 garages were full. The paddock space even took over a large portion of the museum parking lot. This is one huge infield! It was also the biggest trackside service event ever for Duntov. 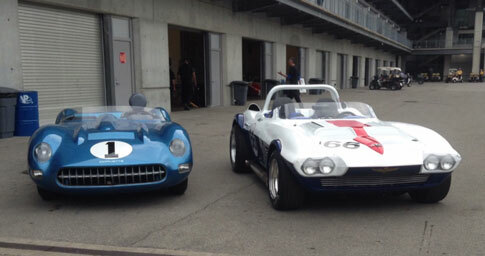 In addition to our #38 car, Clair’s car, and three of Tony’s cars, Duntov introduced a brand new Corvette Grand Sport for Walo Bertschinger, and the #37 AP Corvette of Colby Hillman, which Duntov had restored from a museum piece. We all shared four Formula 1 garages along with our buddy Mark Hildebrand, who looked after his own car. Walo’s Grand Sport was the star of the show. This car is the first correct aluminum birdcage Grand Sport built by Duntov, or anyone else for that matter. The body was built in the plaster molds taken off original Grand Sport # 002; the only unwrecked original Grand Sport still in its original paint. Walo’s car is as close to a perfect continuation Grand Sport ever. It was built to exactly replicate Grand Sport 001 as it was raced by O.J. Hanna in 1969. All of OJ’s innovations and alterations were reproduced and included in this car. Walo is from Switzerland and is an accomplished motorcycle racer. This was his first automobile race, and he pulled it off beautifully. He finished 11th overall in a field of 28; second in class. Similarly, this was Colby Hillman’s first race back since he raced in the mid 70’s. He perchased his car last December from a museum and had it shipped to us for a total restoration. Colby’s weekend went well, with no issues whatsoever. He drove conservatively, without a bobble and finished 13th in a competitive field of 25 cars. Clair had a perfect weekend as well, finishing 6th. Alan finished third, so he got to be on the podium and drink the traditional milk. There seemed to be some confusion as to the exact boundaries of the racetrack. There was an newly installed asphalt ‘island’ that defined a chicane in the middle of the Hullman straight. The racetrack was to the left of the island. Drivers were told at the driver’s meeting that anybody who went to the right of the island (thereby straightening out the chicane) would be black flagged. 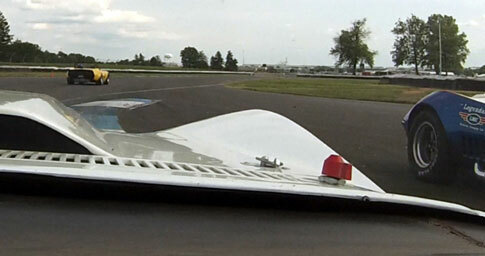 Here is a still from Bob Caudle’s in car video of Peter Klutt blowing by on the right while bypassing the chicane. The shortcut was worth about 2 seconds a lap. In the race, Bob Caudle being passed by Klutt who is 20 feet off the racetrack. Klutt qualified on the pole, but took a wrong turn on the pace lap! Rule 1: Follow the Pace Car. Rule 2: Don’t pass the Pace Car! Klutt took the third place qualifier Mike Donohue with him, and to the surprise of the rest of the field, the green flag flew anyway. Klutt spent the entire race blowing by people on the right of the chicane and finished 2nd. 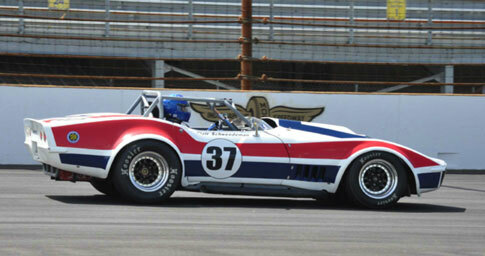 The Duntov #38 Corvette suffered from untested new parts. We had installed new front shocks and the valving was off by a ton. One test session at home would have caught it, but there was nothing we could do at Indy, as the shock’s range of adjustments wouldn’t reach the sweet spot. This was a case of customer cars come first and we just make due! Tony introduced a couple of new concepts at this event, including the first ever Indy Celebrity Pro-Am. This was the Sunday feature race, and it paired amateur owner/drivers with veteran Indianapolis professional drivers in a 45 minute ‘enduro’ with one mandatory pit stop. The only eligible cars were small block Corvettes, Camaros and Mustangs. On Tuesday Tony used his #05 small block 72 Corvette to familiarize as many of the Pros as possible with the track and the cars. All the drivers seemed thrilled to be back at Indy, and seemed to love driving our cars. I never heard a negative comment. Tony was too busy to get any laps of his own in his 05 car, so he asked Edward to drive for him and paired Edward up with Willie T. Ribbs! What a combination! They finished 3rd. After the race Willie told Edward that just prior to the race eventual winner Al Unser Jr. told him to cut the chicane. Al told Willie that Klutt told him it was worth 2 seconds a lap! Willie used the advantage to slice through the field and get to the podium. Short cut or not, Willie T. Ribbs is still one hell of a racecar driver! We look forward to racing with him again next year; this time for the win! Another of Tony’s innovations was to allow everyone the opportunity to drive the oval. That was an experience none of us is likely to forget. 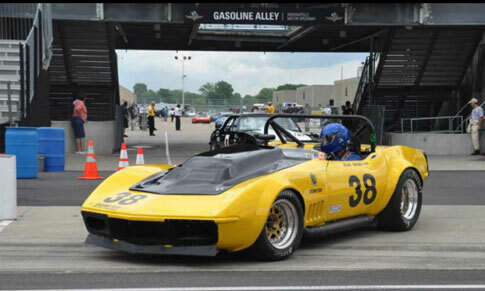 The Duntov #38 Corvette was running a 3.70 diff, so 7500 RPM in fourth is 166 MPH. Just walking through turns two and four, the car accelerated to 7500 in a quarter of the straightaway, and you just had to hold it there. I would have loved to have had a 2.70 instead of a 3.70! Unfortunately The Indianapolis Motor Speedway Museum’s priceless 1957 Corvette SS had an inglorious outing. Here it is at Sebring in 1957, and on the oval at Indy this weekend. Prior to the meltdown, the Indy museum curator asked if we wanted to photograph the Duntov Grand Sport 006 with Zora Duntov’s first all our racing Corvette, and we readily agreed. Tony also gave every driver at least a hundred baseball card sized ‘Hero Cards’ with their cars pictured on the front and the driver bio on the back. Kids were encouraged to get driver autographs and the whole promotion was a super big hit! The event was an overwhelming success with spectators, competitors, the management of IMS and apparently the City of Indianapolis. Just wait until next year! I expect attendance will triple, and if it does Tony may have to print up a boatload more Hero Cards! Hero Cards for Tony’s three SVRA racecars.